Over the last few years, Erin Foster has had the good fortune to celebrate holidays onboard Disney Cruise Line ships during Easter, Mother’s Day, July 4th, Halloween, Christmas, and New Year’s Eve. 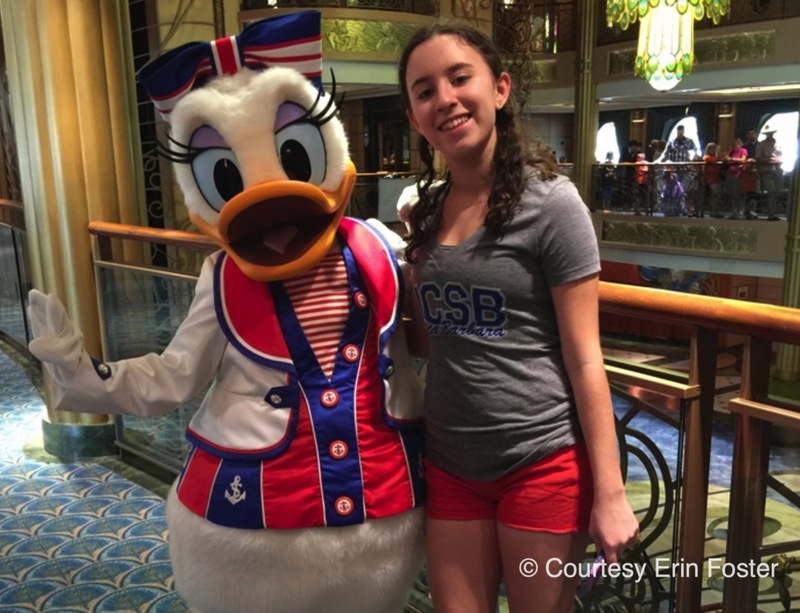 Erin is the coauthor of The Unofficial Guide to Disney Cruise Line, and she shares her experiences with us. 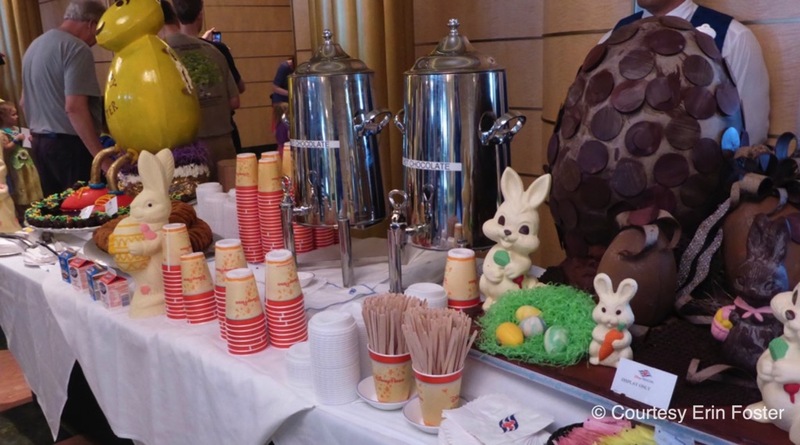 The celebrations range from barely mentioned (Mother’s Day) to all-out extravaganza (Halloween), but most of them follow a common pattern that includes themed food, special costumes for the Disney characters, parties in the ship’s lobby atrium or on the pool deck, stateroom gifts, extra activities for children, and decorations around the ship. Here is what to expect. During most holiday sailings, you’ll have at least one day when the classic Disney characters (Mickey, Minnie, Donald, Goofy, Chip & Dale, and sometimes others) appear wearing costumes that are themed for the event. 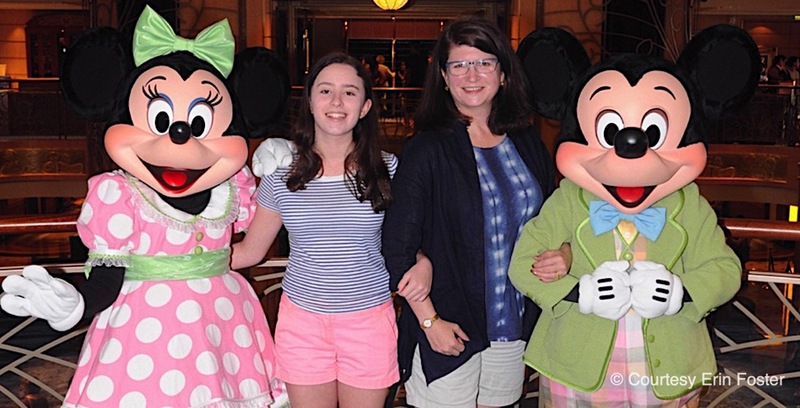 Disney aficionados often make it a point to pose with characters while they’re decked out in unusual clothing, so these are often crowded photo ops with lengthy waits. 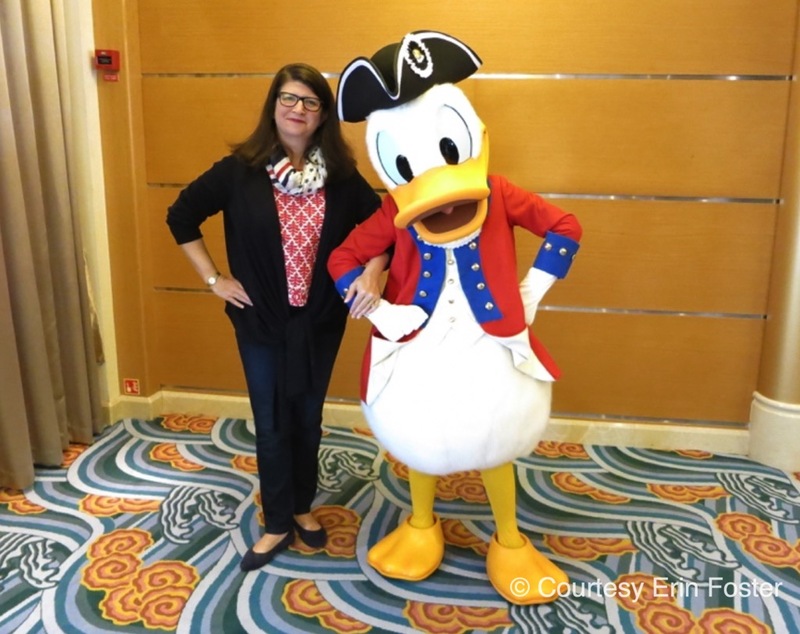 But don’t worry if you’ve been looking forward to seeing Mickey in his usual red, black, and yellow garb because he’ll be out and about on the ship wearing his usual duds too. 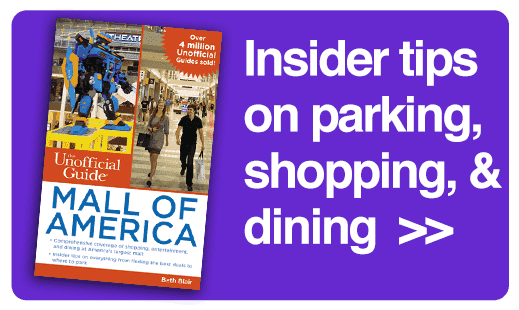 During many holiday cruises, you’ll find that there are nods to the holiday in the menus and food presentation. 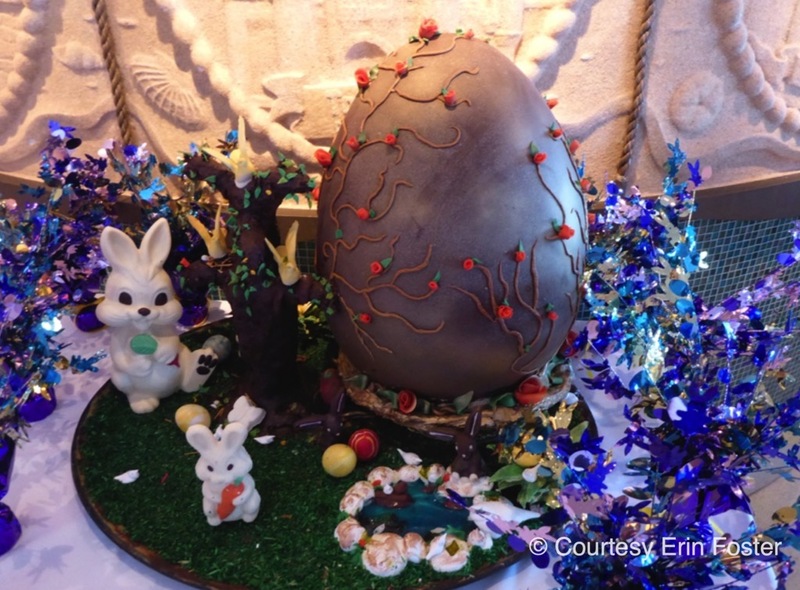 These may include large dessert spreads in the lobby atrium, themed foods served in the Cabanas buffet (we’ve seen red, white, and blue pancakes on July 4thand Bûche de Noel on Christmas), special items on the main dinner menus, or themed drinks of the day. 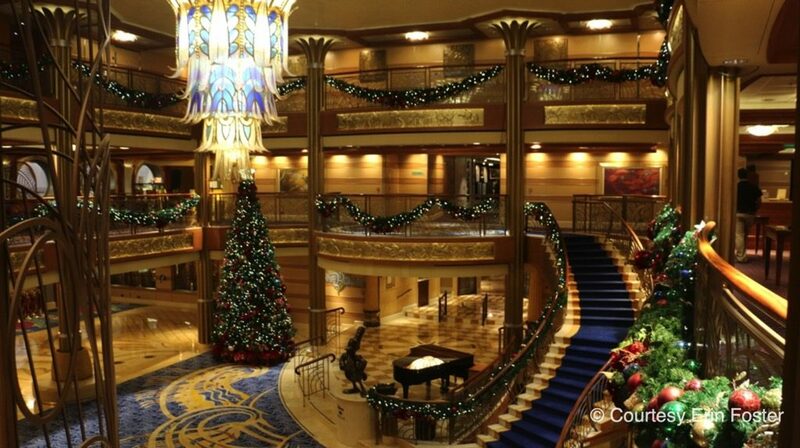 Most holidays include themed parties in the ship lobby atrium, on the upper pool deck, or in both locations. The parties typically include character appearances, audience participation dancing, confetti, cheering, and general merriment. 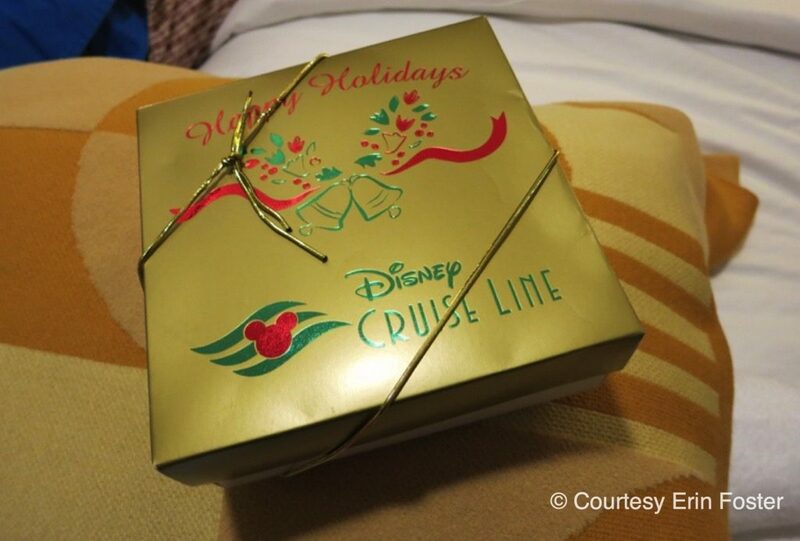 During our Christmas and New Year’s Cruises, we’ve received stateroom gifts from DCL consisting of chocolates and a commemorative lithograph. On New Year’s Eve, our stateroom host left us festive paper party hats and tiaras to wear during the evening. And on Christmas, our towel “animal” got a Santa hat accessory. 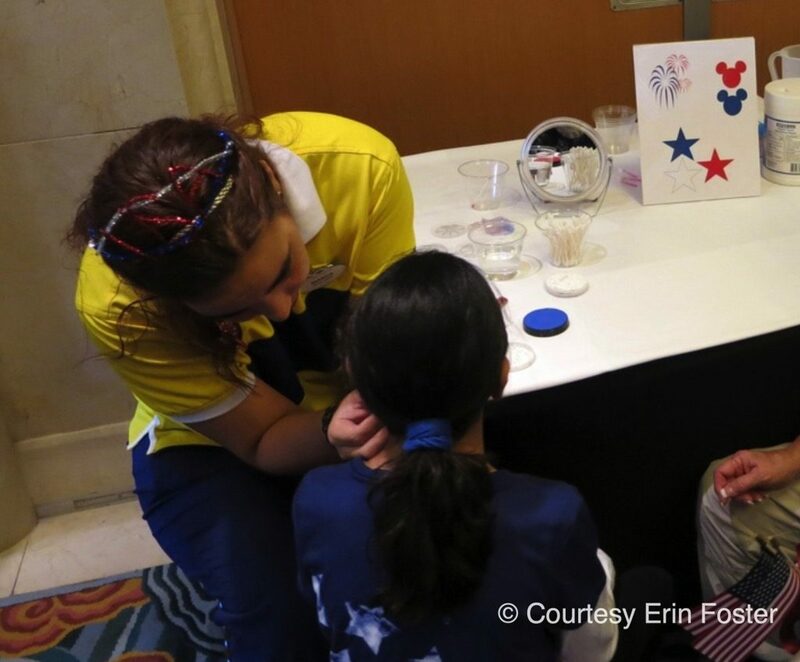 Holidays typically see a few additional themed activities for children and families, which might include themed scavenger hunts, face painting, or seasonal crafts. 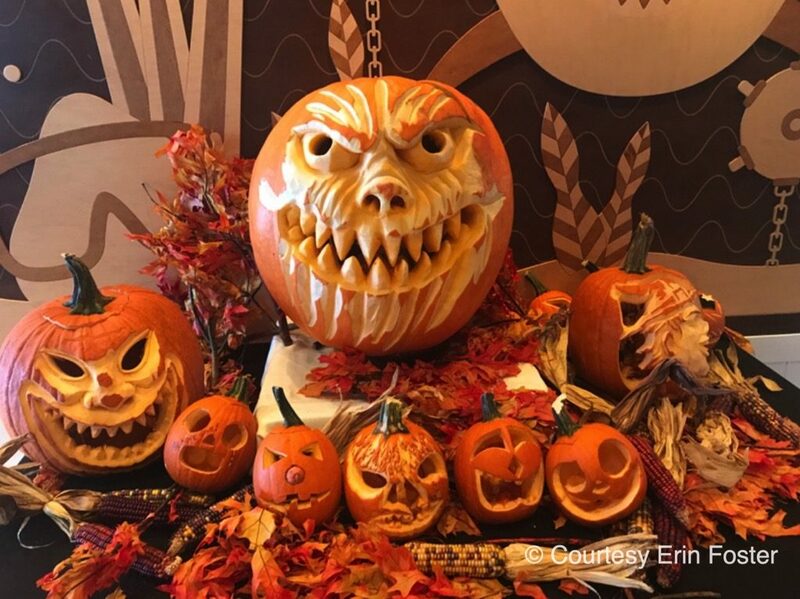 Halloween and Christmas cruises have such intense decor that Disney markets them with special names: “Halloween on the High Seas” and “Very Merrytime Cruises.” The theming for these holidays is spread throughout the ships and even on Castaway Cay, Disney’s private island. Other holidays don’t have all-encompassing decor, but there will likely be a table set up in the lobby with a nod to the celebration. While full-on celebrations with multi-day merriment are guaranteed on Christmas and Halloween, other holidays get varying degrees of attention. I sailed on the Dream on Mother’s Day, and the only real acknowledgement of this was well wishes from our Main Dining Room server. 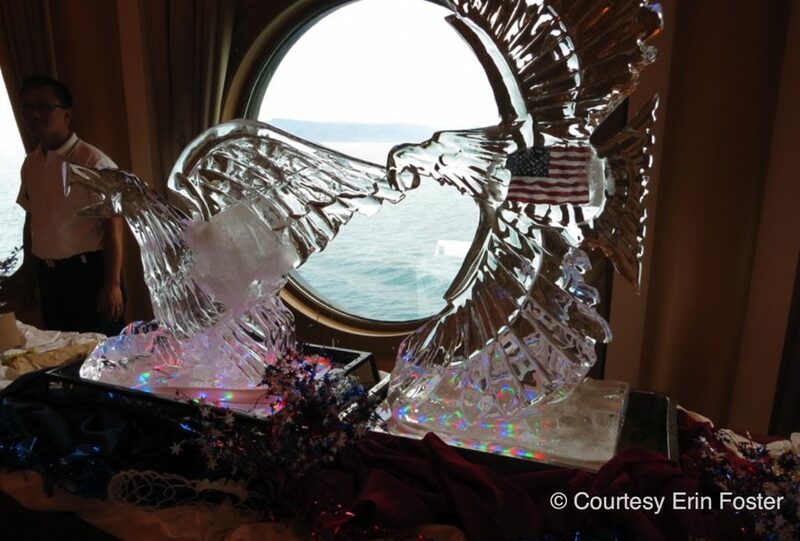 Easter, July 4th, and New Year’s Eve were one-day affairs, with little spill-over into the rest of the cruise. American Thanksgiving gets a similar one-day treatment. Be aware that the Disney ships are very American in their holiday festivities. 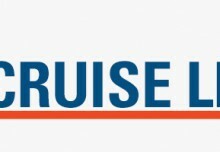 For example, my 4th of July cruise also included Canada Day, which got a one-sentence mention in the daily newsletter, the Personal Navigator, but nothing else. As you can see, Disney does quite a bit to put guests in a holiday mood, but you may have special family traditions you may want to honor. By all means, personalize your celebration by bringing stateroom decor (personal holiday magnets for your stateroom door are particularly popular), festive clothing, treats, or other items to make the holiday your own. 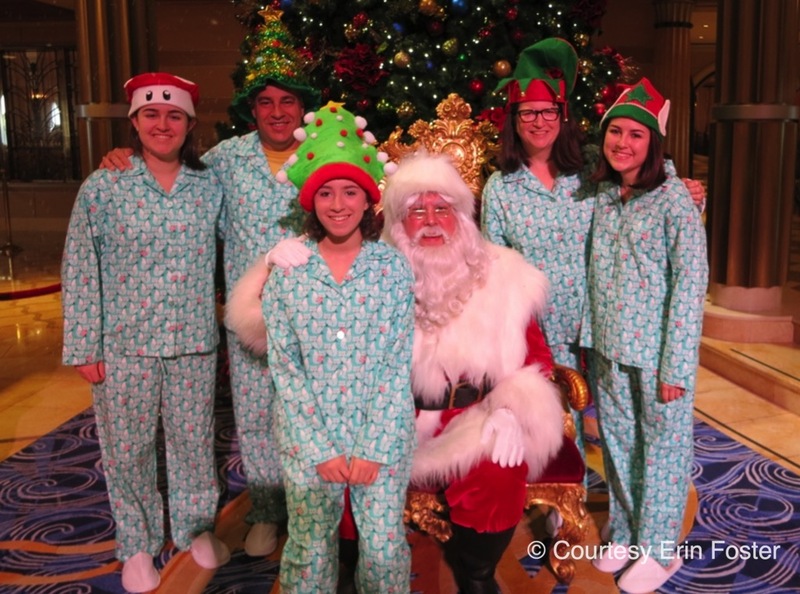 We weren’t the only family on our Christmas cruise to bring festive matching pajamas to wear during Santa photos. 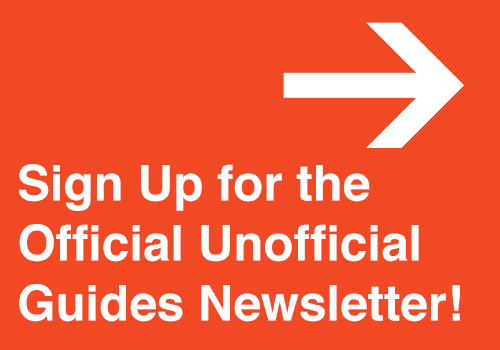 However, remember to check the list of prohibited items before going all out with your personal planning. For example, holiday string lights are prohibited on board and all food brought onboard must be prepackaged and factory sealed. Save mom’s homemade cookies to enjoy back home. Are Holidays Onboard Disney Cruise Line Worth It? Celebrating holidays on Disney Cruise Line ships can be a blast, but typically these cruises come with premium pricing. 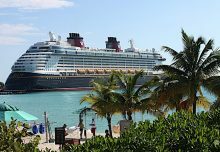 If you want the holiday decor but are flexible with your schedule, Disney Cruise Line sailings in early December are often much more affordable than those that actually include the holiday. 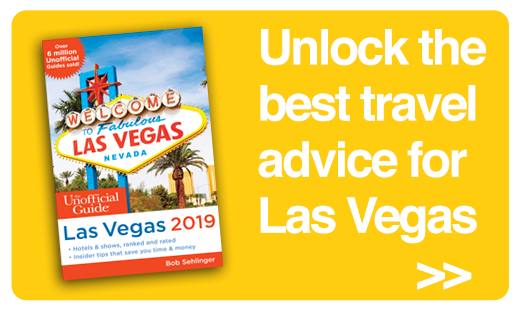 Personally, I wouldn’t book a holiday cruise just to see some decorations and characters in costume, but if the price and timing are right, then holiday-themed cruises can add a little oomph to your sailing experience. 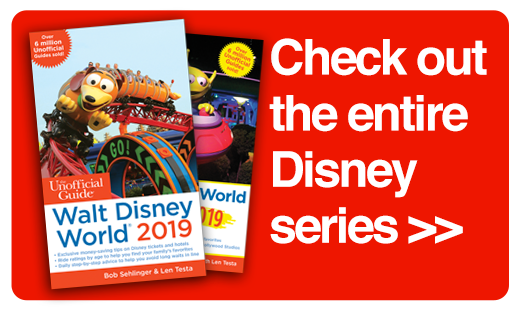 If you want some extra theming but can’t sail on a holiday (or you want to avoid a holiday that you don’t celebrate), then a good alternative might be the Marvel, Star Wars, or Frozen-themed sailings. 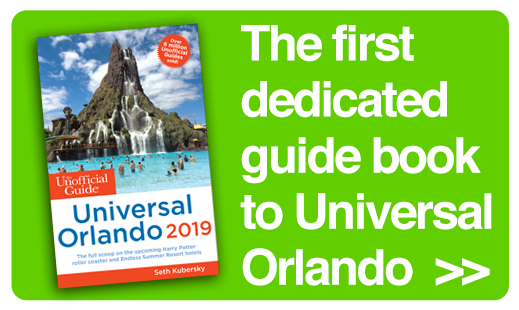 These also include special character experiences, themed food, and children’s activities, and they have a similarly festive atmosphere without any baggage that some might associate with a holiday. 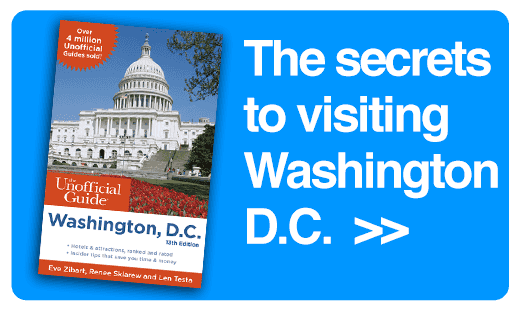 When to Book Your Disney Cruise?